With Father's Day recently past, I'm sure that like me, you had some memories of your father stir in your heart. For some of us, there are good memories. For others, well not so much good memories, but memories they would like to forget. In my case, I remember a place and a time with my father that taught to me trust. The water was murky, deep, and swarming with all kinds of river creatures. Black River is its name. It is located near the town of Walnut Ridge, Arkansas. My dad was born and raised in that little town before moving to the big city of St. Louis to work for the General Motors Corporation. Many of my childhood memories take me back to Walnut Ridge. I remember the days of traveling in our green brown-paneled station wagon to see grandma. Before grandma moved into town, she lived deep in the woods. We drove on dirt roads for miles. There were watermelon and rice farms as far as the eye could see. The scenery was a still frame. Farm houses. Outhouses. Dilapidated schoolhouse. And, an old white church house that at one time had been the gathering place of worshipers for the little community in the woods. Many of our trips to see grandma would be spent on the banks of the Black River. It was as primitive as you can get. No RV's. No electrical hook-ups. No bathhouse. It was camping as rough as rough can be. Thinking back to those days, I never remember anyone complaining about how rough it was. The Black River was the center of our entertainment as kids. It was also the place where I learned to trust. In order to play in the river, we had to know how to swim. One day, my dad decided he was going to teach me. He said, "I needed to trust him and not be afraid." He picked me up as high as he could and asked me, "Are you ready?" I said, "Ready for what?" The next thing I know, I am flying through the air and seeing the water underneath me. I heard myself screaming in one moment and gasping for air the next. I'm kicking my legs and wailing my arms. My dad said, "It's ok, I'm right here." He picked me up and I held tightly to his neck. "I don't ever want to do that again," I said. But, I heard my dad's voice say to me again, "Trust me." He picked me up as high as he could and said, "Ready?" Apparently, he didn't hear me because I was flying through the air again. Gasping, kicking, and screaming. It was in the Black River that I not only learned how to swim, I learned how to trust. Trusting in someone takes time. There are many who have been disappointed, abused, and/or neglected. To tell someone to trust in a God whom they cannot see and that He will never disappoint, abuse, nor neglect us is hard. This trust has to be tested and approved over time. Yet I believe that the more we learn to trust God and allow ourselves to be vulnerable and open to Him, the more we develop a deep trust in Him. I want you to trust Me in your times of trouble so I can rescue you and you can give Me glory (Psalm 50:15 LB). But I trust in your unfailing love. I will rejoice because you have rescued me (Psalm 13:5 NLT). We face our unwanted surprises gasping and kicking and screaming. Abraham named the place Yahweh-yireh (which means "the LORD will provide"). To this day, people still use that name as a proverb: “On the mountain of the LORD it will be provided" (Genesis 22:14 NLT). And this same God who takes care of me will supply all your needs from his glorious riches, which have been given to us in Christ Jesus (Philippians 4:19 NLT). Life can be like being thrown into the Black River for the very first time. We face our unwanted surprises gasping and kicking and screaming. Life isn't easy, people can disappoint us, and some will even be abusive or neglectful or hurtful. However, God is always faithful to provide us with the resources we need to live physically and spiritually. Our heavenly Father is Yahweh-yireh, and as we face life's unexpected surprises God will provide. God's promise to Joshua is also God's promise to each of us! No one will be able to stand against you as long as you live. For I will be with you as I was with Moses. 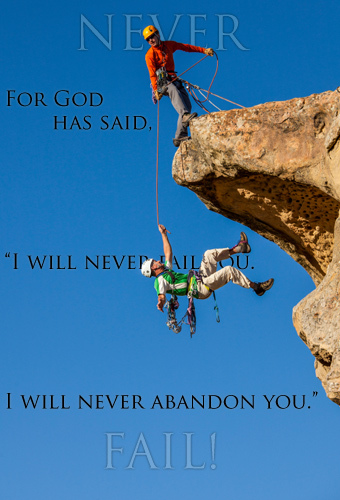 I will not fail you or abandon you (Joshua 1:5 NLT).For God has said, “I will never fail you. I will never abandon you.” So we can say with confidence, "The LORD is my helper, so I will have no fear. What can mere people do to me?” (Hebrews 13:5-6 NLT). And then there is all that we say we believe in the Bible! If you cannot see this embedded video, go to Worship House Media. "Learning to Trust" by Brian McCutchen is licensed under a Creative Commons License. Heartlight encourages you to share this material with others in church bulletins, personal emails, and other non-commercial uses. Please see our Usage Guidelines for more information.